RS485 module, Support ASCII and Modbus RTU Protocol. 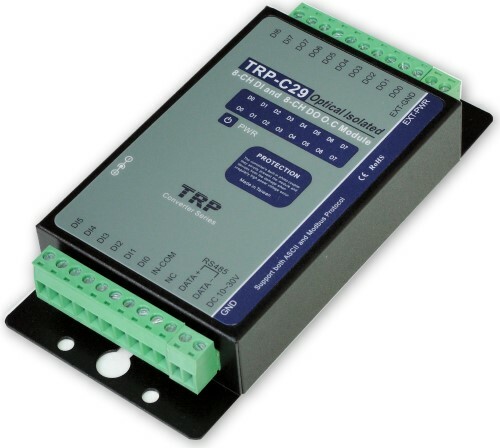 TRP-C29 provides with 8 optical isolated digital input channels and 8-channel digital output open collector. All channel features screw terminals for convenient connection of field signals as well as LED’s to indicate channel status. Input channels are equipped with 3750Vms DC isolation, and surge protection on RS485 data lines that protect the module and devices against high power voltage input and ground potential differences. 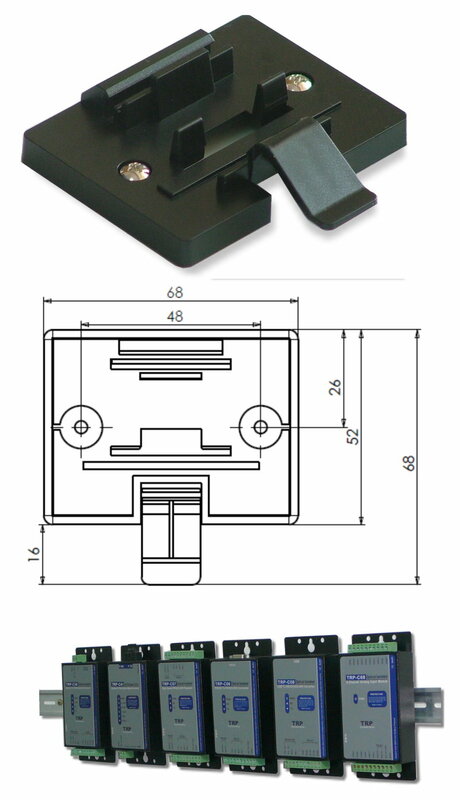 For easy user access, TRP-C29 can enter configuration mode and self-test mode with outer dip-switch. TRP-C29 support both ASCII and Modbus protocol, with a full set of command, dual watch-dog, and auto reset function the module can be bi-directionally remote controlled by PC in ASCII or Modbus RTU protocol. All 8 channels digital input ca be used as counter. Digital input signal with 3750Vrms isolation protection. Input channel: 8 digital input channels. Input logical level 0 : +/-1V (max). Input logical level 1: +/- 4.0V ~ +/- 30V. Input counter :Dec 0~65535(max) or Hex 0000~FFFF(max). Digital output Maximum voltage: +/-30V. Output Maximum current: 100 mA. Communication speed: Baud rate from 1.2kbps to 115.2Kbps. Dual watchdog: Hardware reset circuit, module and host operating status. Signal LED: Power on, all channels.